As the May 16 Budget Day is less than a month away, the government is already rehearsing its central narrative: that New Zealand is on track to reach a surplus by 2014/15. This is both a realistic view and a considerable achievement – and yet not nearly enough to deal with our long term challenges. Finance Mister Bill English can and should be proud of his record. In adverse global economic times and despite the costly rebuild following the Canterbury earthquakes, he has stuck to his agenda of fiscal consolidation. Not many other finance ministers would have done so. The temptation to use either the global financial crisis or natural disasters as a justification for increased borrowing and spending was certainly present. Cheques sent to households, subsidies thrown at the ailing car industry, ill-conceived home insulation schemes and infrastructure programmes of questionable quality have all helped drive the Australian government deep into deficit. Prime Minister Julia Gillard then added her own policy disasters to Australia’s budget blowout. In stark contrast, New Zealand has remained fiscally prudent over the past five years. This is all the more remarkable since we did not have the luxury of an Australian-style mining boom. Instead we are dealing with a natural disaster causing damage worth more than 10% of GDP. Unfortunately, future historians are unlikely to heap as much praise on the government. The reason is simple: As tough and responsible as it is dealing with the short and medium term issues facing New Zealand, the government’s approach to long-term fiscal sustainability is weak and careless. If Messrs Key and English care for their place in the nation’s history books, they will need to do much more than “just” returning the budget to surplus by 20141/5. They would need to ensure with their policies now that their successors in the distant future stand a chance of delivering balanced budgets as well. Last year, the OECD assessed the long-term viability of public finances in its member states with a so-called fiscal gap analysis. This calculated the immediate rise in the underlying primary balance needed to bring gross financial liabilities to 50% of GDP in 2050. The OECD found New Zealand needed the second highest adjustment, surpassed only by Japan in the developed world. To limit public debt to half our annual economic output, we would need to cut government spending by about 10% of GDP – a massive task. The culprit behind these alarming figures is obvious: demographic change. Across the developed world people enjoy longer life expectancy. This is obviously good news – except for public finances. They will take a battering from increases in superannuation spending, healthcare expenditure and provisions for old age care. While most other countries have already made changes to their retirement age, the prime minister has categorically ruled them out in an election promise. He even has a good argument for sticking to his promise. Tinkering with the age of eligibility for New Zealand super, though certainly desirable, would not close the fiscal gap. The required adjustment is so huge that an increase to, say, 67 years, would only be a first step towards making superannuation sustainable. But just because an increase in the age of eligibility is not sufficient, and may not be urgently required for the next parliamentary term or two, it does not mean Mr Key’s government can afford to sit back, relax, and do nothing. Yet in essence, this seems to be the government’s attitude when it comes to New Zealand’s fiscal gap. In this sense, the government’s fiscal record is mixed. While doing a remarkable job in steering New Zealand through testing economic times, they are closing their eyes to the longer-term problems. In this way, they may well achieve a budget surplus in a couple of years’ time. But it would be a pyrrhic victory indeed if New Zealand’s fiscal path pointed firmly downwards from there. Politically, Mr Key’s position on superannuation is understandable – not just because of his previous election promise. Any changes to the age of eligibility, the level of payouts, let alone means-testing the whole system, are political poison. Yet to defuse New Zealand’s ageing time-bomb, probably all three issues would need to be tackled simultaneously. No wonder Mr Key would prefer one of his successors to deal with these unpleasant tasks. Or to say it with Madame de Pompadour’s words, “Après nous le deluge” (after us the deluge). On the other hand, he probably does not want to leave a political legacy behind that will, in retrospect, only make him one of New Zealand’s best liked prime ministers. If in the future he also wants to be regarded as one of the most important prime ministers, he should make long-term fiscal consolidation the theme of his campaign for a third term in office. It is a challenge of historic proportions to get New Zealand fit for the demographic future of an aged society. It certainly makes returning the budget to surplus look like a walk in the park. But as opinion polls show, New Zealanders certainly understand the need to deal with our changing demography. In fact, only 20-30% of New Zealanders intend to retire completely, i.e. not receive any paid work after reaching the age of eligibility. 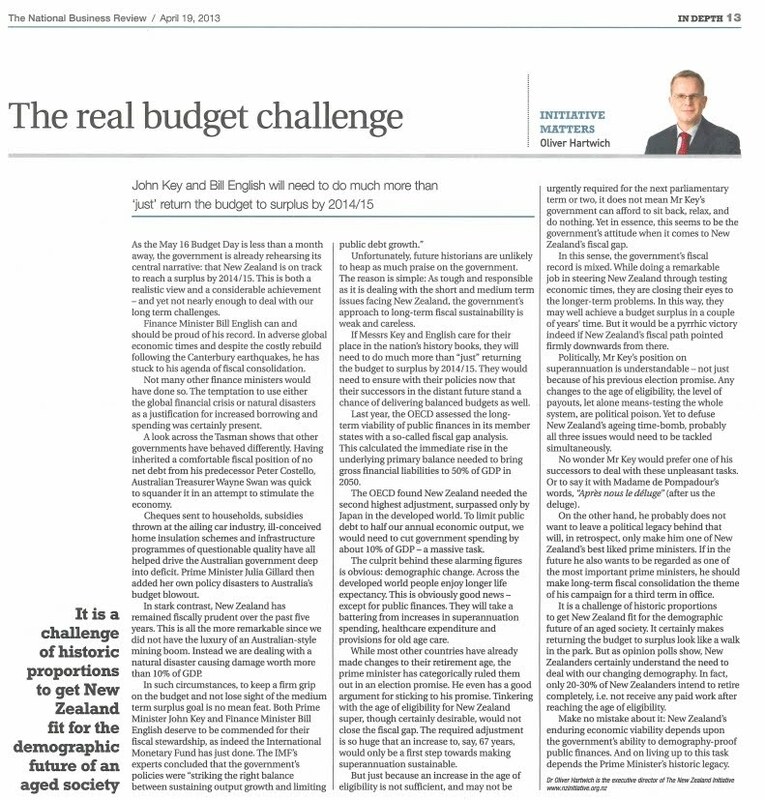 Make no mistake about it: New Zealand’s enduring economic viability depends upon the government’s ability to demography-proof public finances. And on living up to this task depends the Prime Minister’s historic legacy.